Printing Inks « Global Market Insights, Inc. 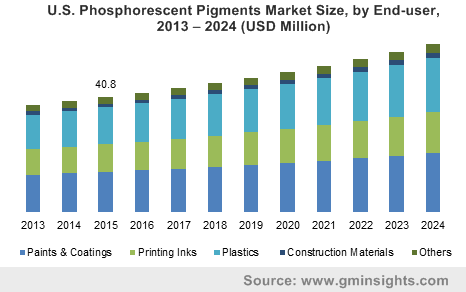 Taking into consideration the geographical landscape, Europe flexographic printing inks market is forecast to record notable gains of over 4.5% over the coming seven years. The huge presence of cosmetic manufacturing firms in the region is expected to drive the market. Germany and France are likely to be the major revenue contributors. 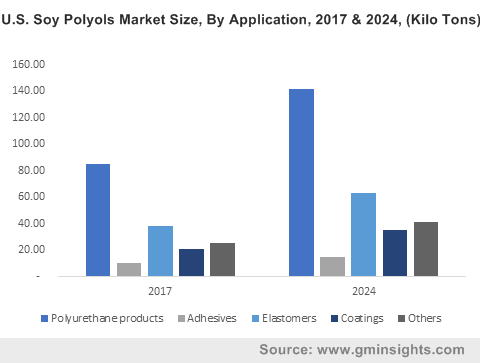 The North America industry is expected to make major revenue contributions toward flexographic printing inks industry, driven by escalated product demand across the food packaging sector. The U.S. is projected to contribute a large chunk towards the regional share. Asia Pacific flexographic printing inks market, which collected a revenue of over USD 2.5 billion in 2015, is anticipated to experience a notable surge over the coming timeframe. The growth can be credited to altering lifestyles of consumers along with the rise in the purchasing capacity of the middle-income groups. India and China are expected to majorly boost the regional share. Flexographic printing inks find extensive applications in corrugated containers, tags & labels, flexible packaging, metal cans, and folding cartons. Flexographic printing inks industry size in the flexible packaging sector is forecast to grow considerably over the years to come, driven by the product’s favorable features such as moisture retention, aroma preservation, sealing, and improvement of aesthetic appearance. UV-cured, water-based, and solvent-based inks are the major products types of flexographic printing inks industry. 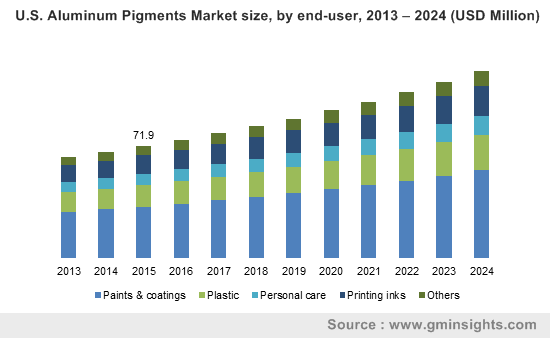 Water-based flexographic printing inks market, which dominated the overall industry size in 2015, is expected to witness a substantial growth over the next few years. The growth can be ascribed to its major application in newspaper, paper, and cardboard printing. 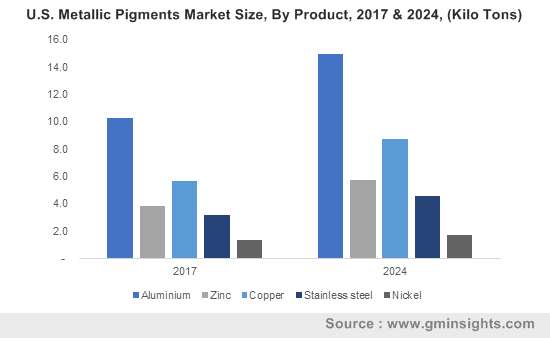 Growing use of non-VOC inks across the printing sector coupled with mounting government support for usage of low VOC inks across the food & cosmetic packaging sectors will push the revenue. 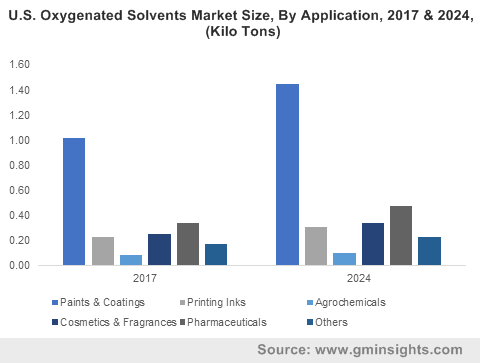 Solvent-based flexographic printing inks industry revenue, which was estimated at over USD 1.5 billion in 2015, is expected to expand remarkably over the coming years. Favorable properties such as scratch resistance, exceptional printing ability, and durability has made the product more popular across the packaging sector. UV-cured flexographic printing inks market size is expected to grow at a CAGR of over 6% during the period from 2016 to 2024, driven by the product’s ability to provide color consistency, chemical resistance, gloss, and rub resistance. 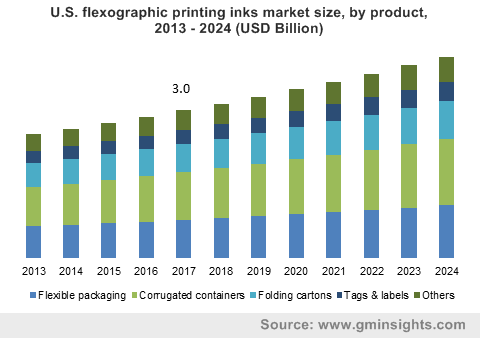 Flexographic printing inks industry is highly fragmented with top six industry players contributing less than 20% of the global market share in 2015. TOYO Ink Group, Flint Group, ALTANA AG, INX International, Wikoff Color Corporation, Sun Chemical, Zeller+Gmelin GmbH & Co. KG, A.M. Ramp u. Co. GmbH, T&K TOKA Company Limited, Siegwerk Druckfarben AG & Co. KGaA, Sun Chemical, Zhongshan DIC Colour Company Limited, XSYS Print Solutions Limited, and Shanxi Tercel Ink Group are the major participants of flexographic printing inks market. This entry was posted in Polymers and Advanced Materials and tagged Flexographic, Flexographic Printing Inks, Flexographic Printing Inks Market, Flexographic Printing Inks Market Analysis, Flexographic Printing Inks Market Froecast, Flexographic Printing Inks Market Future, Flexographic Printing Inks Market Growth, Flexographic Printing Inks Market Outlook, Flexographic Printing Inks Market PDF, Flexographic Printing Inks Market Price, Flexographic Printing Inks Market Report, Flexographic Printing Inks Market Share, Flexographic Printing Inks Market Size, Flexographic Printing Inks Market Trends, Inks, Printing Inks.